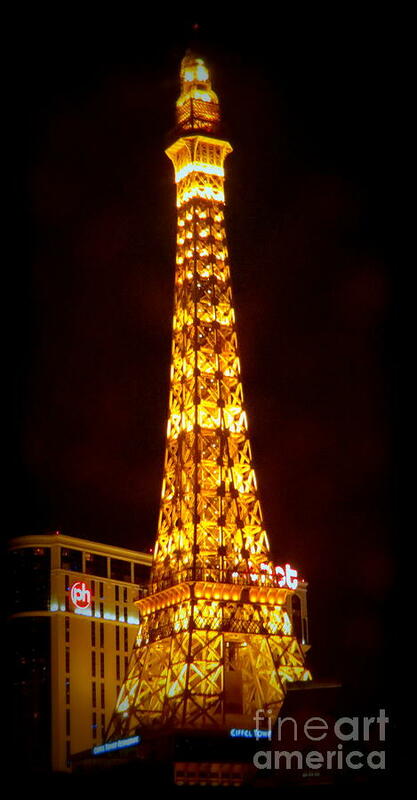 Eiffel Tower Las Vegas Nevada is a photograph by Kay Novy which was uploaded on January 20th, 2013. Paris Las Vegas is a hotel and casino located on the Las Vegas Strip in Paradise, Nevada. The property is owned and operated by Caesars Entertainment Corp. As its name suggests, its theme is the city of Paris in France; it includes a half scale, 541-foot (165 m) tall replica of the Eiffel Tower, a sign in the shape of the Montgolfier balloon, a two-thirds size Arc de Triomphe, a replica of La Fontaine des Mers, and a 1,200-seat theatre called Le Thtre des Arts. The front of the hotel suggests the Paris Opera House and the Louvre. The Paris is linked via a promenade to its sister property, Bally's Las Vegas, through which it is linked to the Las Vegas Monorail. The ground was broken for the Paris Las Vegas on April 18, 1997. The cost of the Paris was estimated at $760 million. Construction on the project began in May 1997 and was completed in April 1999. When the scale model of the Eiffel Tower was designed, it was planned to be full scale, but the airport was too close and the tower had to be shrunk. The scale is approximately 1:2. The property that the Paris Las Vegas is built covers 24 acres (9.7 ha). A unique architectural aspect of Paris is that the back legs of its Eiffel Tower actually come down through the ceiling into the casino floor. 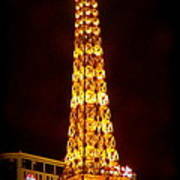 Paris Las Vegas opened on September 1, 1999, with fireworks being shot from the Eiffel Tower. French actress Catherine Deneuve flipped a switch, turning on all of Paris' lights, including the various crystal chandeliers in the main lobby. Thanks so very much, Kathy, appreciate it! Hi Kay, lovely picture,,, good job my friend..love how the light comes thru..fv sherri:):) have a great week friend!!! Thanks Sherri...you have a great week. 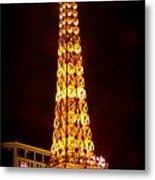 Thanks so very much Jose for featuring "Eiffel Tower Las Vegas Nevada" in your "Stop Time With Art" group! Thank you, Jose for the feature in "Stop Time With Art". Much appreciated. An eye-catching Las Vegas night image, Kay!!! F&V! Thanks so very much, Will. 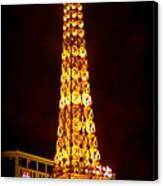 Thanks Nadine And Bob for featuring "Eiffel Tower Las Vegas Nevada" in "USA Artist News". Thanks Krista, for featuring "Eiffel Tower Las Vegas Nevada" in your "Collectors Treasures".